The Trump administration first floated the export changes last year, rejuvenating a campaign to simplify export rules that had been contemplated by the Obama administration but then dropped after the school shooting in Newtown, Conn., in 2012. The State Department sent the final version of the rules to key lawmakers on Monday as part of the mandatory "congressional notification" process. They will take effect 30 days later unless Congress takes the unlikely step of passing a resolution to block them. A copy of the new regulations, marked "Only for State internal use," says that supervision for exports of any semi-automatic firearms that don't use caseless ammunition will move from the State Department to the Commerce Department. The same applies to shotguns, other than those that are fully automatic. Those who want to export flamethrowers that project a stream of fire up to 20 meters (about 66 feet) will no longer need a State Department license. A new paragraph in the rules states that grenades, too, will now fall under the Commerce Department if they contain "non-lethal or less lethal projectiles." Most parts, components and ammunition for firearms are also being moved to the Commerce Department. 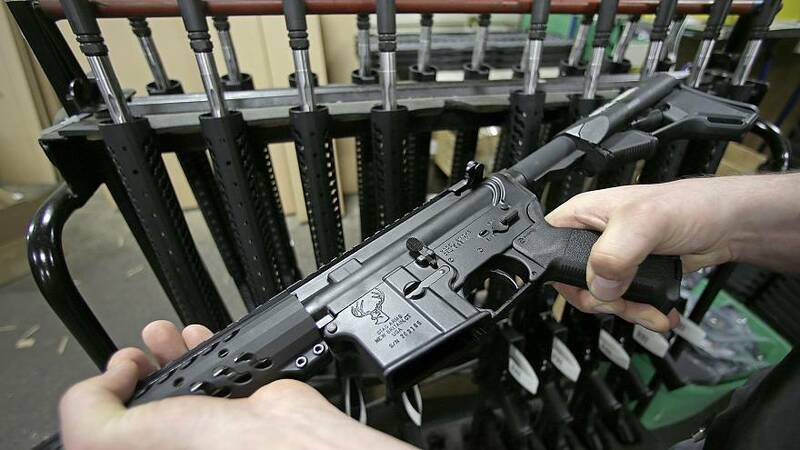 Part of President Trump's push to reduce regulations government-wide, the new rules aim to assist American gun manufacturers by making it simpler to export products that the Trump administration says are already "widely available for retail sale in the United States." Exports of weapons deemed to have an "inherently military function" or to provide the U.S. with a military advantage will remain controlled by the State Department. But gun control advocates and many Democrats have voiced concerns about the proliferation of weapons in places where, unlike the United States, deadly weapons aren't readily available at sporting goods stores or major outlets like Walmart. "In most countries it is much more difficult to obtain any kind of firearm, much less a semi-automatic rifle or a flamethrower," said John Lindsay-Poland, a gun trafficking expert at the human rights group Global Exchange. "In a context where such weapons aren't available to ordinary people, they become weapons of war, whether we're talking about insurgencies or terrorist organizations or organized crime. They use those weapons to control territory, carry out acts against civilians and to contest state power." In 2017, opposition from lawmakers thwarted a Trump administration proposal to let Turkish President Recep Tayyip Erdogan's bodyguards buy $1.2 million in U.S. guns, following violence against protesters during an Erdogan visit to Washington. A similar process stopped the U.S. from selling tens of thousands of assault weapons to the Philippines' national police in 2016. Under the new rules, exporting guns will also cost less. Unlike the State Department, which charges an annual $2,240 fee for licenses to export firearms, the Commerce Department licensing process doesn't require a fee. Although some Democratic opposition is expected to the new rules, they are likely to take effect anyway. New Jersey Sen. Bob Menendez, the top Democrat on the Senate's foreign relations panel, plans to put a hold on the rules, The New York Times has reported. But to block the rules permanently, Congress would have to pass a resolution disapproving them, a maneuver that has been rarely attempted and even less frequently successful. The official said the changes would "significantly reduce the regulatory burden on the U.S. commercial firearms and ammunition industry, promote American exports, and clarify the regulatory requirements for independent gunsmiths, while at the same time prioritizing national security controls and continuing our ability to restrict exports where human rights, illicit trafficking, and related issues may be of concern." Still, the NRA-Institute for Legislative Action, the gun group's lobbying arm, encouraged the administration to tweak the rules by removing even more categories of items from the State Department's control, including silencers and high-capacity magazines. "The NRA believes that, on the whole, the proposal correctly balances the imperatives of national and global security, allocation of oversight resources, and promotion of American industry, innovation, and competiveness," wrote Christopher Zealand, the group's senior research attorney. "To cite just a few reasons, it will make it easier for dictators, organized crime, and terrorists to obtain guns in large quantities," wrote one individual who submitted comments, Marilyn Guterman. "Please, in the name of peace and sanity do not allow this to happen."